Beautiful Gulf Front Condo in Privately Gated Beachfront Community!! Only steps from beach! Enjoy the gorgeous clear waters of the Gulf and the sugar white sands from our condo in a family friendly gated community of Silver Dunes – the place where wonderful vacation memories – and traditions – are made. Our spacious 2 bedroom, 2 bathroom fourth floor condo is perfect for family and adults alike! With unobstructed views of the beach, pool and courtyard it will be hard to leave your patio! The beautiful landscaped lawn is right outside our door – easy for keeping an eye on the little ones as they play. The pool and children's pool are also just a few feet away with the beach (and first class beach service from George!) just beyond that. Our condo comes with flat screen TVs, fully stocked kitchen, and free high speed internet access. Amenities abound at this gorgeous eight-acre resort. Enjoy the private beach, lighted tennis courts, arcade room, laundry facilities close by, basketball goal, and fitness center. Begin your day with the sunrise and a walk along the beach or end your relaxing (or fun filled!) day watching the sunset. The Silver Dunes community is in a perfect location – right in the heart of Destin! Enjoy the many theme parks in the area – including The Track Recreation Center, Big Kahuna Water and Adventure Park, and coming soon, the GI Joe Adventure Park. Lots of shopping complexes are within a few minutes (Destin Commons, Silver Sands Outlet Mall, HarborWalk Village, etc.). The Destin Harbor – with fishing charters, wave runners, ziplining, parasailing, and so much more! – is just 3-1/2 miles away. Enjoy the plentiful restaurants – from top notch to the quick bite – within a few minutes' walk or drive away. So many great ways to make wonderful vacation memories when you stay at Silver Dunes Penthouse-B! Minimum renting age of 25 years old. Cancellation Policy: If you cancel between time of booking and 90 days before your arrival, the forfeiture is the 3.5% reservation fee of the rental total. From 60-90 days prior to arrival, you lose your deposit. Once you pay your balance 60 days before arrival, there are no refunds. We do, however, offer optional travel insurance AFTER you make your reservation (it's a better policy than at time of booking) for a cost of 6.95% of reservation total..
Met our needs. Slightly dated. Acceptability clean for a beach condo. Comfortable beds. Had all kitchen necessities. Be sure to bring you own spices & condiments. Complex was good. Beach and umbrella service was great. Paying extra for umbrella was worth it. Thank you for taking time to leave us a review! We are glad you enjoyed your time with us. Great point about spices and condiments, as these are not allowed to be left behind for health/sanitary reasons. Glad to to hear that the beach vendor set you up with adequate arrangements. We look forward to having you with us again soon! Thank you for staying with us...we agree that this property is comfortable and close to some of the best restaurants and shopping Destin has to offer. We hope to have you with us again soon! Our overall visit was nice however the unit could have been cleaned better. The closet door was broken. Simple but extremely clean condo. Been staying at Silver Dunes 30+ years. No one else comes close for a family vacation. Walked down to the beach the first time this year and George the beach keeper wanted to know where the rest of the family was. They grew up with him as well. Won’t get that personal relationship anywhere else. Quite, no thrills, family friendly, no bull. Why stay anywhere else? This was honestly the perfect beach escape! From the location of the condo, right on the water. To the beach themed condo with a complete view of the ocean and sunset.. you honestly couldn’t ask for more, especially with the price! We were able to fit 8 comfortably! The property has a nice pool, but who uses the pool in DESTIN! A gigantic grass lawn for a good old fashion family field day! 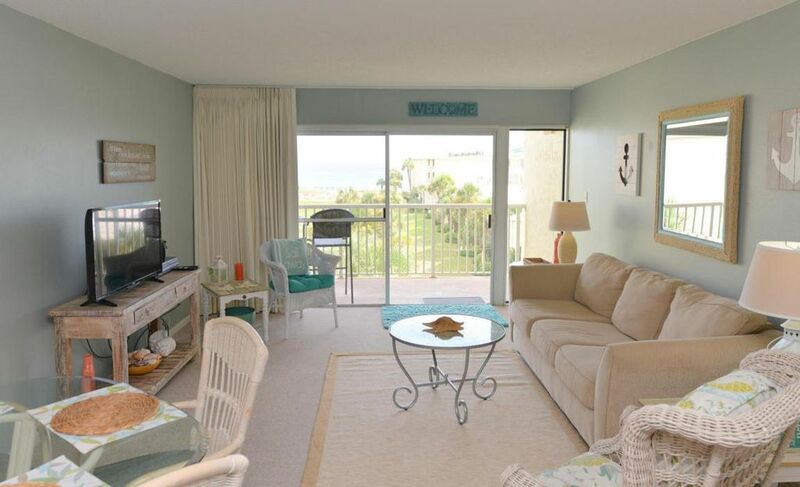 The condo is centrally located to food, shopping and the boardwalk! Plus it’s gated! I will also say, being able to reserve our beach chairs ahead of time was a HUGE bonus! Nothing anyone hates more than carting kids, toys, chairs and umbrellas down to the beach! Not to mention, the beach is private for the guests on property, clean, and GORGEOUS! We will be staying again! Until then, Destin, stay beautiful! We are delighted to hear that you enjoyed your time with us at Silver Dunes PHB! You are correct...the grounds at Silver Dunes are perfect for groups of all sizes and ages. Glad to hear you were able to enjoy all the attractions that are located within walking distance. We look forward to having you stay with us again very soon!